ABERDEEN PROVING GROUND, Md. – Dismounted Soldiers carrying full battle gear are pushed to their physical limits. Soldiers often heft 100 pounds or more of essentials. How the soldier of the future maintains a decisive edge may lie in innovations developed by the Defense Advanced Research Projects Agency, better known as DARPA. Army researchers have been evaluating prototype devices for DARPA at Aberdeen Proving Ground, Maryland. Researchers from Harvard University’s Wyss Institute for Biologically Inspired Engineering spent the past several years developing a biologically inspired smart suit that aims to boost efficiency through a new approach. A series of webbing straps contain a microprocessor and a network of strain sensors. 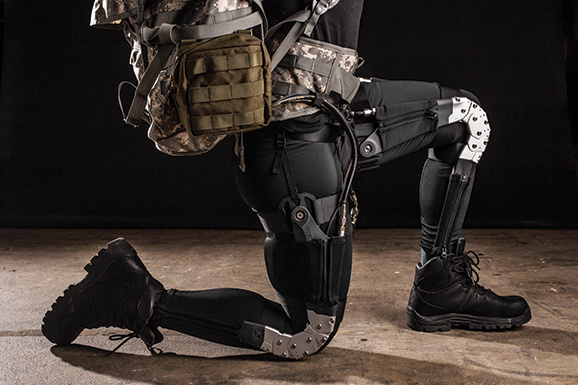 “The suit mimics the action of leg muscles and tendons so a soldier’s muscles expend less energy,” said Dr. Ignacio Galiana, a robotics engineer working on the project. Galiana said the team looked to nature for inspiration in developing cables and pulleys that interact with small motors to provide carefully timed assistance without restricting movement. DARPA selected the U.S. Army Research Laboratory to evaluate several Warrior Web prototypes at the Soldier Performance and Equipment Advanced Research facility, or SPEAR. During testing, soldiers wear the prototype while carrying battle gear. Researchers capture data as the soldier walks on an instrumented treadmill that measures how hard the feet hit the ground with each stride. 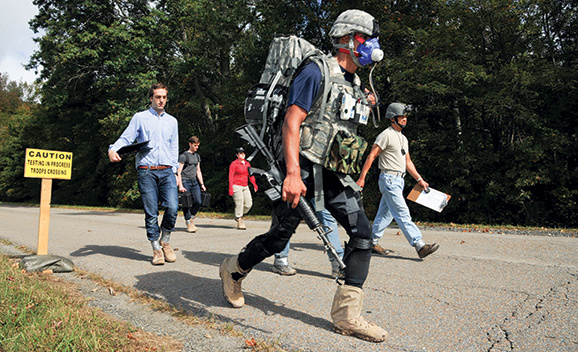 Army evaluators and the Harvard researchers walked alongside Spc. Rafael Boza, a soldier from the 1st Infantry Division at Fort Riley, Kansas. Boza tested the prototype Oct. 2, on a three-mile course of paved roads and rough terrain. DARPA also turned to Army researchers during the first phase of Warrior Web prototype development last year. The Army Research Laboratory tested nine devices on soldiers over a 21-week period. The Army plans to continue to gather high-resolution, highly controlled data during evaluations. “I think this approach has contributed to our success because all of the performers knew that they would be undergoing independent testing by a very qualified team with an excellent facility,” Hitt said. Then, DARPA called on industry and academia for proposals to begin the second period of testing, or Task B. “We received an incredible response and were very fortunate to have a huge pool of very competitive proposals,” Hitt said. Note: The U.S. Army Research Laboratory is part of the U.S. Army Research, Development and Engineering Command, which has the mission to ensure decisive overmatch for unified land operations to empower the Army, the joint warfighter and our nation. RDECOM is a major subordinate command of the U.S. Army Materiel Command.